We woke up early at Granny Stanton's place. It wasn't as cold as it had been - the clouds had rolled in over night. It wasn't a morning for moving too fast - Richard's cold was pretty set in. But we spent the morning over breakfast and more family photos, some of which were capture and put in the digital Family Album. Then, after slightly less than 24 hours, it was time to part ways again - this time with a promise to come back more often (every thirty years seems to be a bit much of a gap). 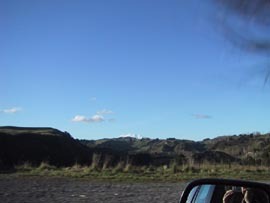 As we got back on the road it started to rain a bit, but we soon drove out of it over the flat roads that lead north from Levin. 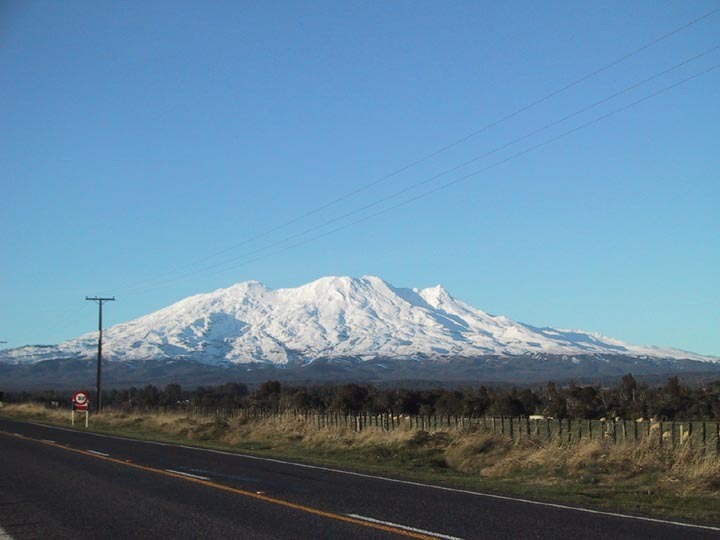 We had decided to take the western road back up the other side of Lake Taupo. 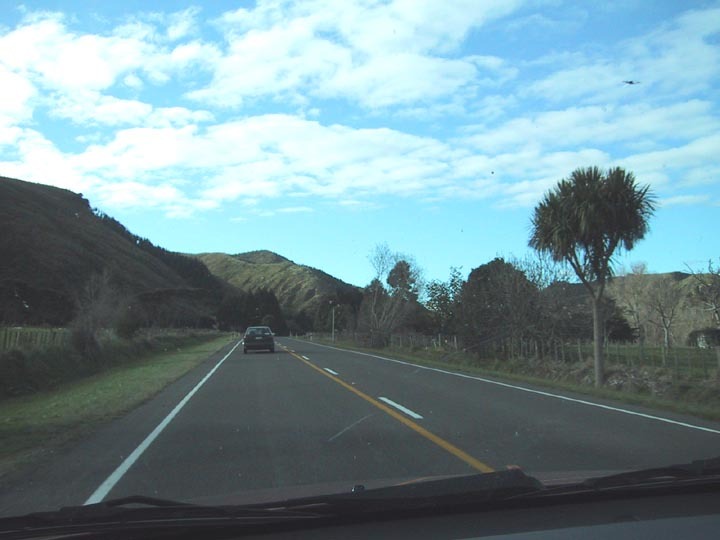 While the first part of the road was pretty flat, suddenly the foothills rose up, and the drive became reminiscent of driving the Fraser Valley - narrow winding roads punching between (and through) hills that open into great big valleys covered with agriculture. 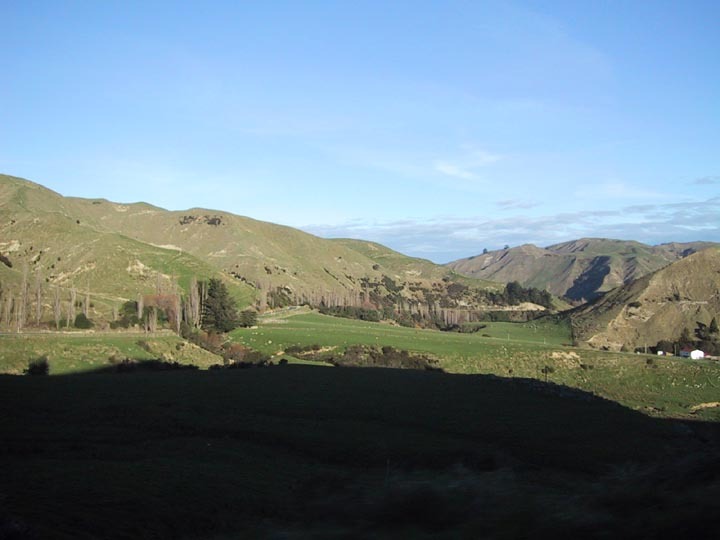 Only where the Fraser Valley is brown, New Zealand is green - and covered with sheep! 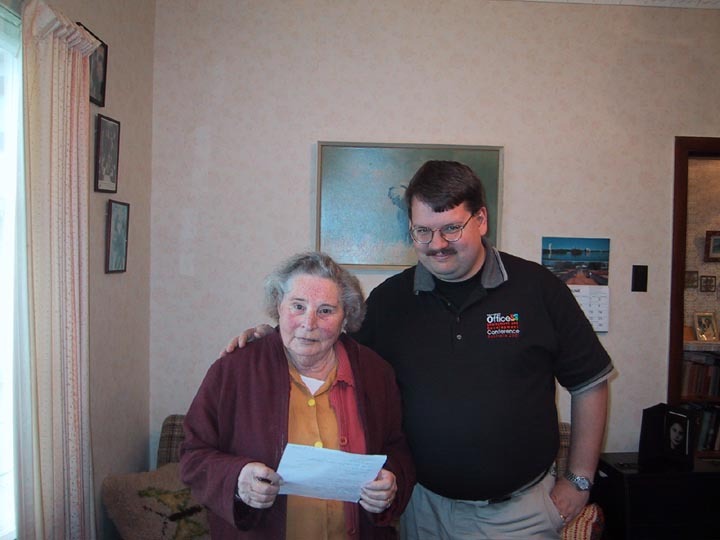 Richard poses with Granny Stanton - gotta get at least one picture together. 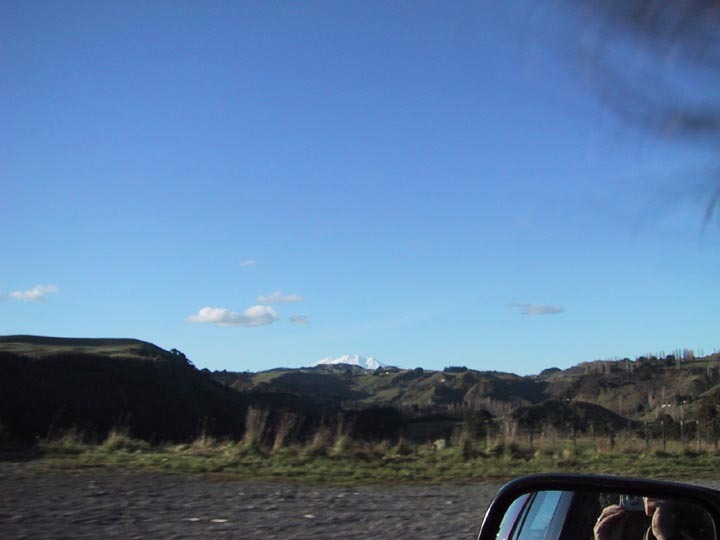 Approaching the foothills on the way up the west side of Lake Taupo. Notice only one lane each way - there were passing lanes every dozen kilometres or so. 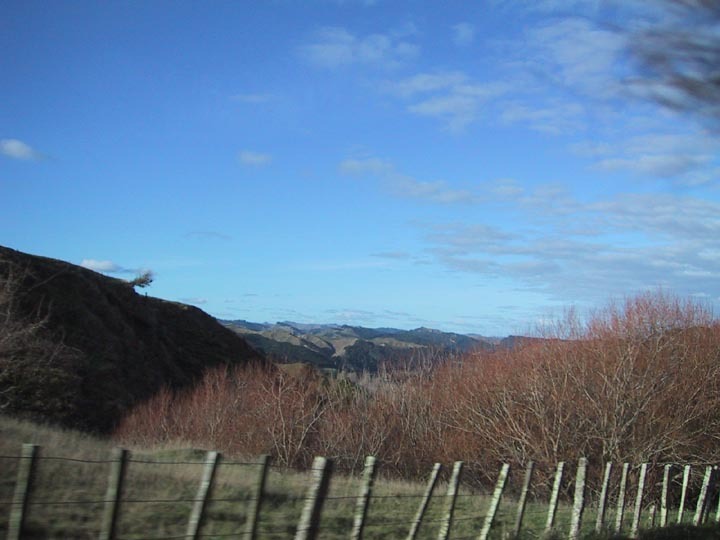 One of the many deep valleys we drove along the side of on our way north. 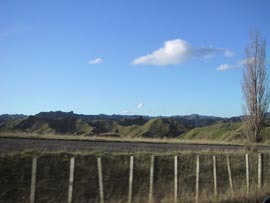 The further north we got, the better the sky was - we left the clouds of Levin behind. 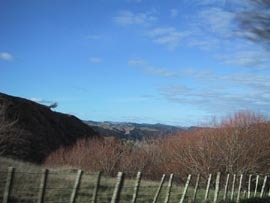 Every so often you got a peek over a ridge that let you know these rolling hills and valleys just kept going. Another look into a big valley. 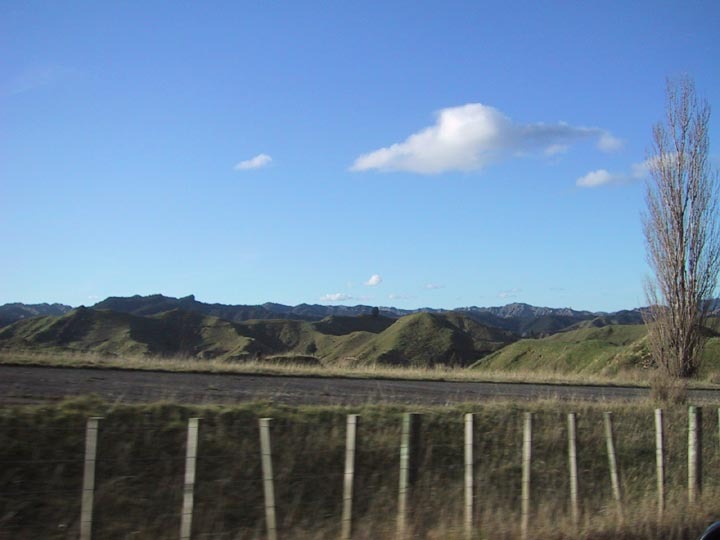 The shadow in front is caused by the hillside we're driving against on our way north. Things got a bit scrubbier at one point - almost desert highway like, but not much of it. 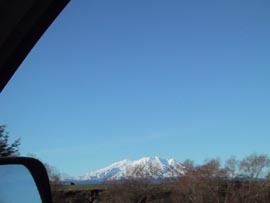 The volcanoes re-appear in the distance as we get further north. We stopped in Rauhiti for gas and a bathroom break. 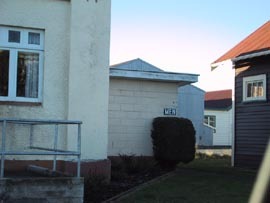 We had learned that most gas stations and restaurants in the small towns of New Zealand do not have public bathrooms - they are usually beside the tourist information centre. 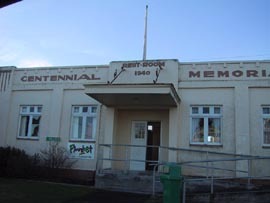 In Rauhiti they have a Centennial Memorial Rest Room, built in 1940 across the street from the County Offices. There was hardly anyone around at all, and we were alone when we walked into the rest room. It turned out there was a single room with two bathroom stalls in it - we didn't see a men or women sign anywhere. Each stall had a toilet and a sink in it. We did our business and then headed out. Only when we were leaving did we see the Men sign around the side of the building - looks like we both went in the women's bathroom. Good thing it was quiet that day. The county hall of Rauhiti, across the street from... ...the Centennial Memorial Rest Rooms! Only in the 1940s could you memorialize going to the bathroom. Ah, see, men enter from the back. Too bad Richard didn't find this sign until after he'd finished... 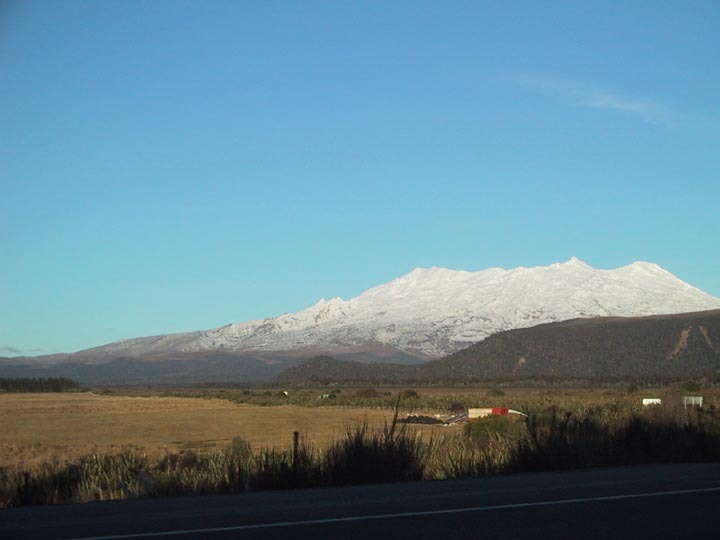 Looking northeast at Mount Ruapehu, on the road out of Rauhiti. 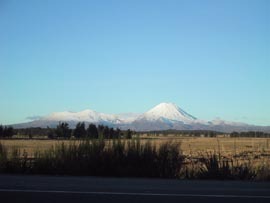 Ruapehu last erupted in 1996. 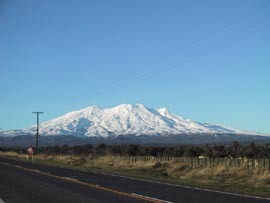 Further down the road the Tongariro chain makes an appearance, Ngauruhoe on the right. Looking back at Ruapehu more southeast now. 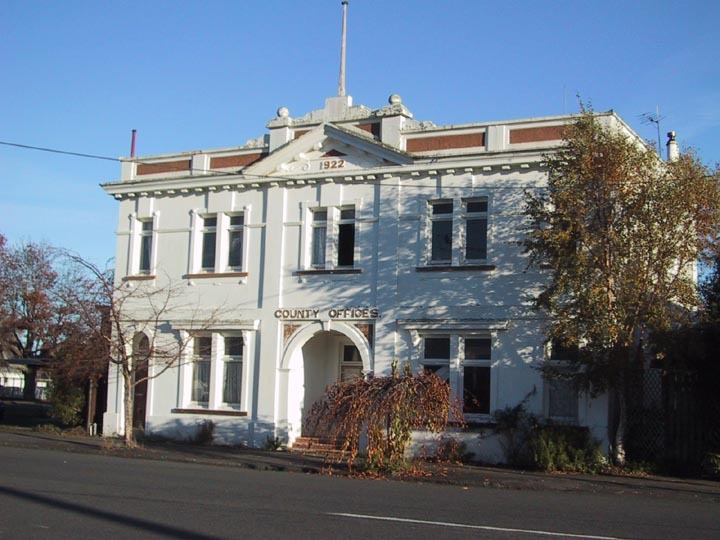 We had agreed that we would only travel while it was light - finding hotels, restaurants and things in the dark is hard in any city, and the little towns of New Zealand its nigh impossible. Based on our pace we decided to stop in the Taumanunui, which was one of the larger dots on the western side of Lake Taupo. It was really a one street township with a few homes off one side, and not much else. 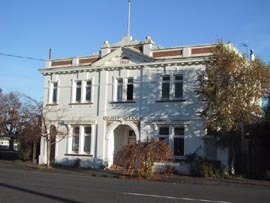 Our guide book showed three hotels and four restaurants in Taumanunui. The best of the hotels had a decent room for us, and also a restaurant - which was unfortunately closed. 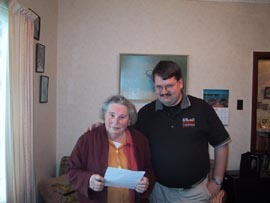 They told pointed us in the direction of another restaurant down the main drag... which turned out to be closed as well. They suggested the restaurant in the hotel! The two remaining restaurants were really greasy spoon Chinese take out places, a block apart. We picked one, ordered what seemed harmless, ate it, grimaced and headed back to the hotel for some sleep. The main drag in Taumanunui. 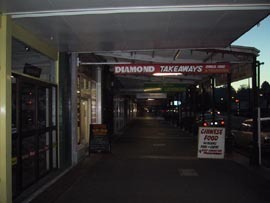 We ended up getting dinner (such as it was) from Diamond Takeaways. 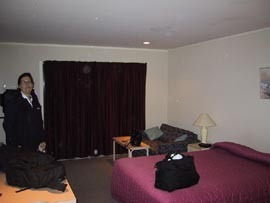 The room in Taumanunui. Nothing to write home about, just a serviceable hotel room. The electric blankets worked, thank goodness. 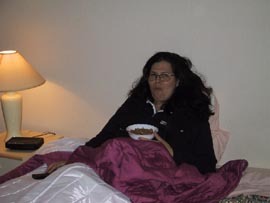 Stacy caught eating cereal in bed before we finally try to get some sleep. 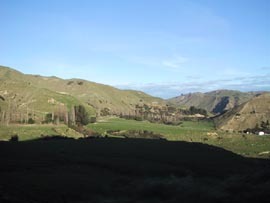 The night in Taumanunui was probably the hardest of the trip - not that the bed was bad (although it wasn't great), but Richard's cold was at its peak, and there was much tossing, turning, sniffling, coughing and blowing of nose the entire night. 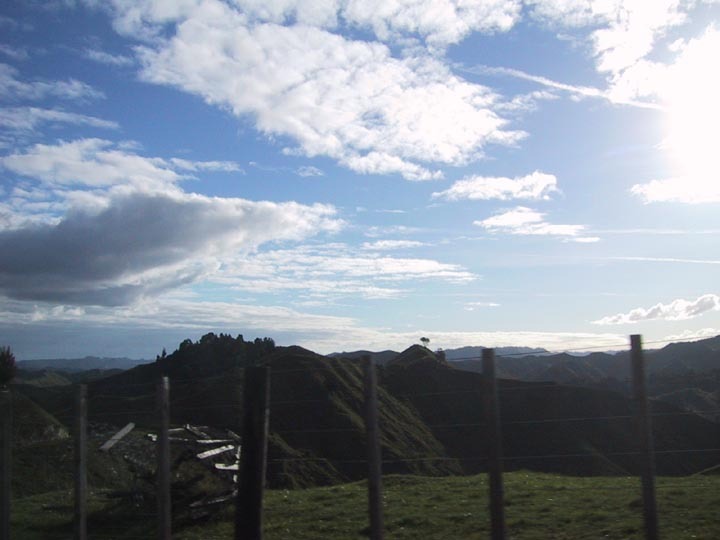 The morning he would improve as we returned to Auckland for one more night in New Zealand.